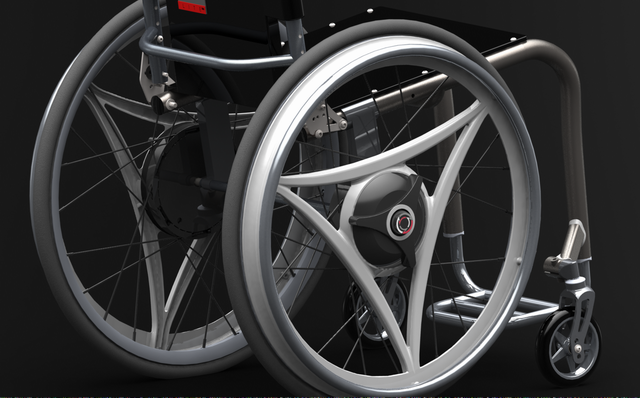 Salim Nasser's wheel design could dramatically reduce the repetitive-stress injuries that often plague manual wheelchair users. Salim Nasser never thought he’d reinvent the wheel. But he’s done it, in a sense, for wheelchairs. Nasser, a NASA engineer, inventor and quadriplegic, has created a wheel that could dramatically reduce how much energy a wheelchair user expends moving his or her chair forward. 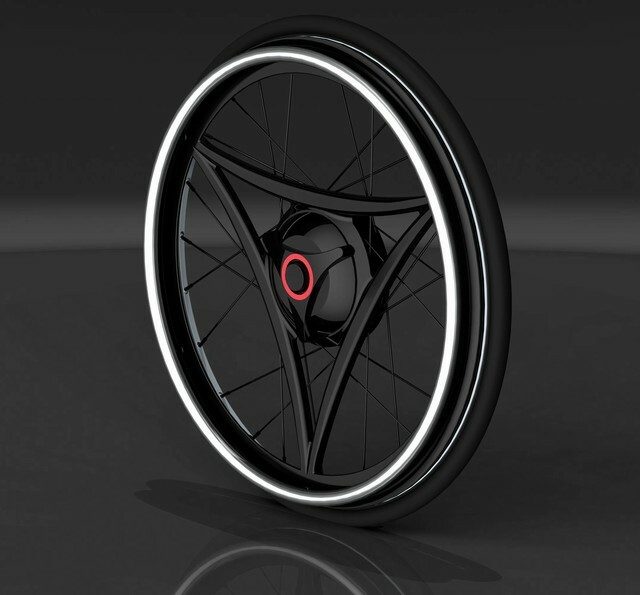 Now Rowheels, the company he cofounded in 2012, hopes to bring the wheel to market later this year. If successful, it should mean more efficient mobility and healthier bodies for users, Nasser says. Standard manual wheelchairs require users to grasp and push a rim that extends from the chair’s back wheels. It’s a decent enough method for self-propulsion, but it taxes small, weak muscles in the shoulders and arms and can lead to repetitive stress injuries. Nasser’s wheel helps target bigger muscles. How it works: Using a mechanical device called a planetary gear, Nasser redesigned the wheel hub so that users pull it backwards in a rowing motion to go forward. Planetary gears are used in automatic transmissions and power tools to reverse and reduce motion, but no wheelchair wheels on the market currently use this design, Nasser says. Jackie Justus, a spinal cord nursing educator at Zablocki Veterans Administration Medical Center in Milwaukee, says a rowing motion for wheelchair users would be a “big step forward and save them a lot of wear and tear.” She has been working independently for the past two years with an engineering team to redesign the wheelchair. Pulling, she says, uses larger stronger muscle groups, while pushing a wheelchair uses little muscles in the front of the body and also hunches over the upper body. The rowing motion makes wheelchair users sit up straight, she says, allowing the diaphragm to function properly and significantly improve breathing. After the accident, he moved to Miami to recover. “Within a year, I regained a bit of shoulder and arm strength, but it was a slow process,” he says. Four years later, he’d gained enough confidence to apply at Florida International University in Miami. He was accepted and excelled, earning his undergraduate and master’s degrees in mechanical engineering over the next 5.5 years. During several summers, he was an intern at the Johnson Space Center in Houston. In 2010, Nasser dusted off his plan and entered a NASA Tech Briefs “Create the Future” competition. Following his win, he began getting calls from companies that wanted to manufacture his wheel. But nothing clicked. Then, while checking his spam folder in October of 2011, he noticed a message from Rimas Buinevicius, an entrepreneur in Madison, Wisconsin. Buinevicius, who led a software company called Sonic Foundry for nearly two decades, had spent eight weeks in a manual wheelchair after breaking a leg. During that time, he said his shoulders and arms hurt from pushing his manual wheelchair wheels forward. “When I read about what Salim had invented, I wanted to contact him because I knew--from my own experience--that there was a need for a better wheelchair wheel design,” says Buinevicius, who runs “Madcelreator,” a company that helps early stage firms bring their ideas to market. “I was initially looking at trying to buy a set of these wheels as a consumer,” Buinevicius says. Then he realized he could do a lot more with Nasser’s idea. Though wheelchairs have evolved over the decades--and racing wheelchairs can look like a bit like sleek motorcycles--wheel technology hasn’t changed much since it was designed more than 100 years ago, he said. After talking with Buenevicius, Nasser says he “got quite excited and redesigned the wheel completely to further reduce the likelihood of people suffering from repetitive stress syndrome while using the wheel. “I figured out that if a typical user pushes 2,000 to 3,000 times a day, on average, my redesign came out to 330,050 less strokes a year,” Nasser says. Buinevicius--who is now the chief executive officer at Rowheels--flew to Florida. The pair hit it off and cofounded Rowheels in 2012. Next, as Nasser continued to improve the wheel design, they entered and won the Grand Prize in the Wisconsin Governor’s Business Plan Contest in June of 2012. Recently, Rowheels showed off the beta design of the wheel at MedTrade, a big medical conference in Atlanta; and the International Seating Symposium in Nashville. Nasser is also working with Georgia Tech's RERC/Wheeled Mobility lab and the Shepherd Center, a hospital in Atlanta that specializes in treatment, research and rehabilitation of people with spinal cord and brain injuries, to improve the wheels. Though the cost hasn’t been determined yet, Buinevicius estimated that a set of wheels will cost between $2,000 and $3,000.